When I think Christmas makeup, I immediately think red lipstick. There’s something about wearing a vivacious red lip colour that makes me feel extraordinarily festive. However, after a recent office chat among the Escentual Beauty Team, we all realised that we want very different things from a red lipstick, which made me instantly want to write this blog post. It’s true that red can be a tough colour to wear, but everyone can rock one. It’s all about finding the right one for you. • Fair/Light skin looks great wearing true red, blue-red and raspberry-red shades. My best piece of advice would be to play it cool! • Medium skin really suits pink reds and orange reds. My best piece of advice would be to avoid blue undertones, as they can look pink on medium complexions. • Dark skin will look great paired with wine-coloured hues of red and orange-reds. My best piece of advice for someone with dark skin looking to wear a bright red would be to use a lip-liner in a bronzy-brown shade to blur the edges, this will stop the contrast looking so dramatic. As for a lipstick’s finish, that’s all down to preference. You can choose between hi-shine, satin or matte, dependant on what finish you prefer. If you’re all about longevity a matte lipstick may be perfect, likewise, if you’re all about a glossy look, you may love to wear something with a hi-shine finish. By day I like to wear a lipstick with longevity. I don’t want to worry about touching it up every two minutes, or catch a glimpse of myself in the mirror with it on my chin (yes, that’s a happened a few times!) 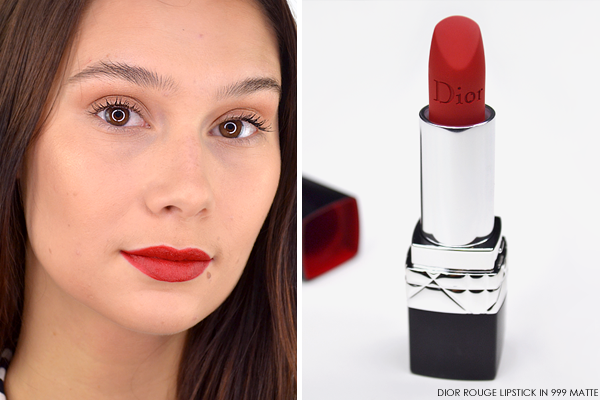 That’s why the iconic DIOR Rouge Dior Lipstick in 999 Matte is my perfect day-to-day red lip colour. With 16-hour wear and a comfortable lip care formula it’s a great choice for someone like me that wants a reliable lipstick that stays put. As for the colour, 999 is a beautiful true red with neutral undertones, meaning it can be worn by pretty much any skin tone. Sometimes my lips can be quite dry, so I always like to have a creamy red lipstick in my stash. 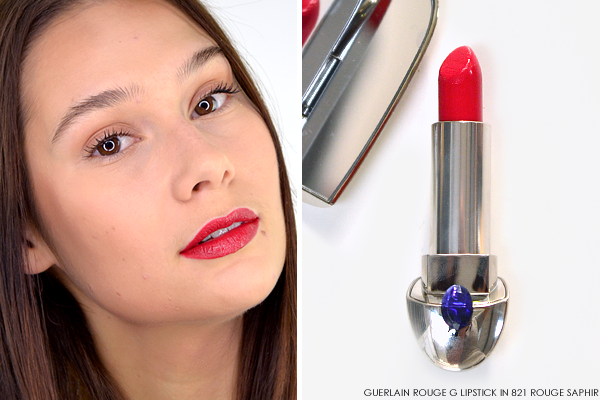 The Guerlain Rouge G in 821 Rouge Saphir is one of my all-time favourite lipsticks point blank. Not only does it feel amazing, but it looks amazing too (just look at that packaging!). A vibrant pink-red, Rouge G works well with my light skin and neutral undertones, and its creamy formula adds dimension to (in my opinion) my somewhat small lips. 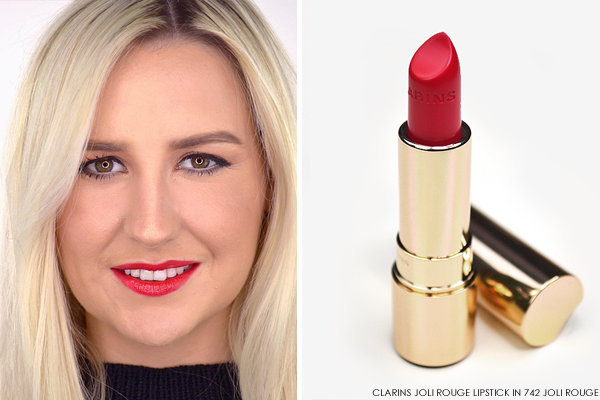 As statement-worthy pouts are essential during Christmas, I always brave the Clarins Joli Rouge Lipstick in 742 Joli Rouge when I’m feeling bold. My favourite thing about the Joli Rouge shade is that it makes me look as if I’ve spent a good hour longer getting ready than what I have done. 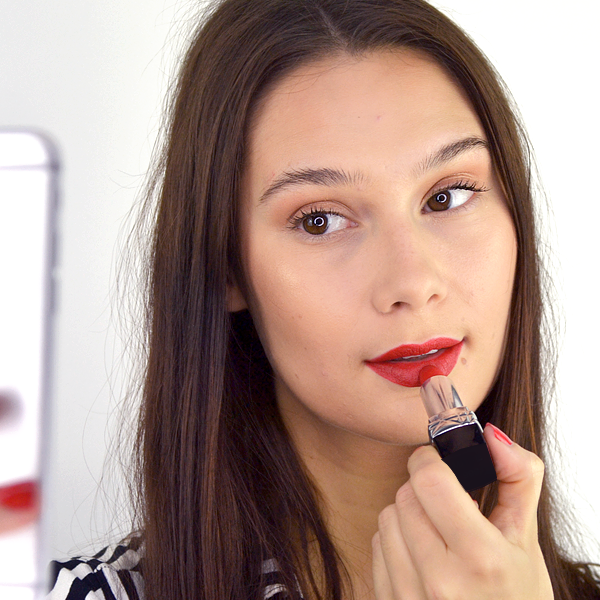 Call it a cheater’s way to looking glam! Its long-lasting finish fits me perfectly – it’s one of the only shades that lets me feel loud and proud when I’m wearing a red, and that’s super rare for me. 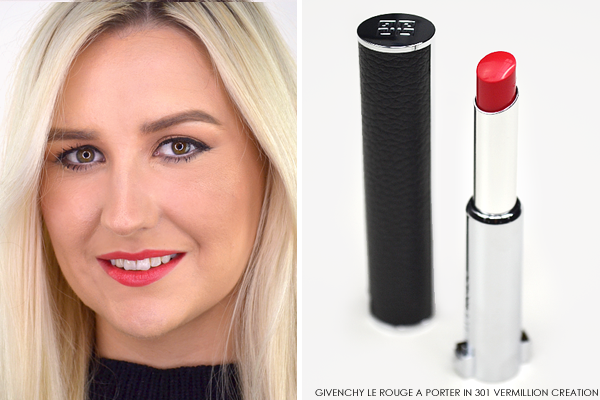 For when I’m feeling like a want a delicate pop of colour, 301 Vermillion Creation is my absolute go-to for a rosy lip. Just enough to be seen, but pigmented enough to stand out, I love the way it brightens my complexion in a single sweep. The finish is more of a glossier look, which I prefer for everyday wear. Highly moisturising and an all round joy to wear, its stunning shade and ridiculously chic packaging are oh-so-hard to resist. I first discovered Laura Geller’s gorgeously pigmented Iconic Baked Lipsticks last Christmas when I shot a video wearing the shade Big Apple Red (if you’re looking for a pillarbox, statement red – that’s your ticket!). I prefer a berried red as I find them to be a little more versatile, so the shade Mulberry St fits the bill perfectly. It’s just a touch pink so it enlivens my complexion nicely, but the depth of colour means that it still makes a big statement. Its staying power is immense, too. 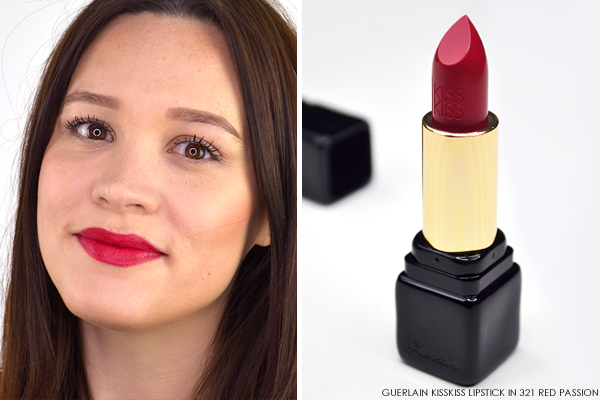 Guerlain’s KissKiss lipstick is one of my favourite lipstick textures. It’s a classic: just a little creamy, with great lasting power and, importantly, it’s not too shiny, as I have a tendency to wipe lipstick off if there’s too much ‘slip’. The shade 321 Red Passion is a knock-out, and it’s the lipstick I choose when I want my lips to be the part of my makeup that does the talking. It’s a pretty ruby shade that leans towards pink, and it wears away really evenly so you don’t have to constantly worry about touching it up. It’s a staple. 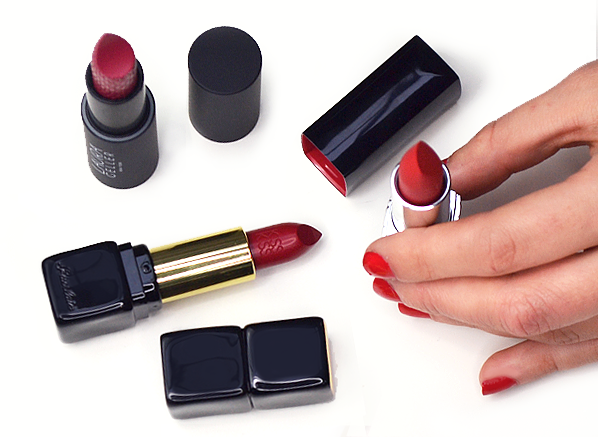 Which of these red lipsticks do you want to wear this festive season? Tweet us or comment below! This entry was posted on Monday, December 12th, 2016 at 5:22 pm and is filed under Christmas, Make-up. You can follow any responses to this entry through the RSS 2.0 feed. You can skip to the end and leave a response. Pinging is currently not allowed.